What does pellet or pebble stool look like? Pellet or pebble stools look like small, rounded, compacted lumps of stool. They are solid, dry and hard masses of dark brown colored stool. Often times, they are also referred to as stools shaped like rabbit droppings, marbles or balls because of their particular appearance. Usually, pellet or pebble stools are eliminated as separate lumps and indicate a severe form of constipation. If the pellets or pebbles are lumped together in one, large, dry, hard stool, the constipation is thought to be slightly less severe. Pellet-like stools can occur in adults, children and babies and may produce significant discomfort ranging from back pain to hemorrhoids flare ups. What do pellet and pebble stool mean? When you have this type of bowel movements, it means you are experiencing a rather severe form of constipation. In order for stools to be this fragmented and compacted that they become hard, dry and rough-textured, either there was a too low a water intake, a too low fiber intake or a too high intake of processed foods and animal products. Some medical conditions, medications or therapies can also cause constipation this severe. Some people experience pellet or pebble stools after days or weeks of dealing with less severe constipation, while others may eliminate stools like this after only a few days of not eating the right foods or not drinking enough water. 1) Eating too little fiber. Dietary fiber is what helps give bulk to stools and both softens their consistency and makes them more voluminous faster, which stimulates intestinal transit and results in higher bowel movement frequency. 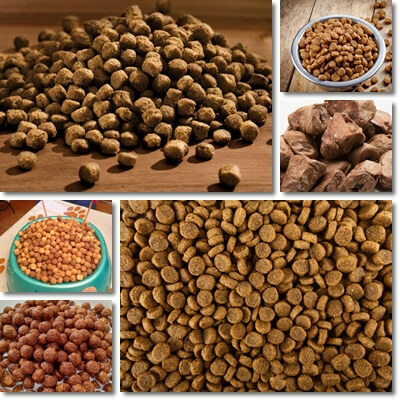 When your diet is low in plant products containing fiber (fruits, vegetables, grains, nuts, seeds) and high in fiber-free animal products (meat, fish, milk, dairy, eggs) or worse, processed foods, digestion takes longer, transit is slowed down and you get really compacted, dry, hard, pebble or pellet stools. 2) Too little water. Fiber needs water. You may eat as much fiber as you want, but if you don’t also drink sufficient water, you can easily get constipated. What fiber does is absorb water to increase bulk and soften stools. This increase in volume stimulates the intestinal muscles to contract to eliminate stools, resulting in a healthy bowel movement frequency and stools that are solid, but soft and easy to pass. Still water, sparkling water, fruit and vegetable juices in limited amounts or herbal teas, also in limited amounts can contribute to a good level of hydration. 3) Coffee. While coffee is used to prompt a bowel movement and relieve constipation temporarily, it actually causes dehydration in the long run and can easily lead to pellet or pebble stools if fiber and water intake are low. In reality, coffee has strong diuretic properties and a certain stimulating action on the gastrointestinal tract, so it doesn’t stay long in the system. But the water it drives out with it doesn’t either. So if you don’t counteract the dehydration it causes by drinking sufficient water and eat foods with fiber to absorb water in stools, you can get hard, dry, pellet or pebble stools and constipation. The higher the coffee intake, the more pronounced the dehydrating effects. 4) Problematic foods. Constipating foods include low-fiber, absorbent foods such as refined rice, bread and pasta, toast, crackers or bagels, hard boiled eggs and can encourage constipation and lead to small, lumpy, hard, dry stools when consumed in large amounts. And while these foods are good to eat when you have diarrhea, they are best consumed in small amounts or paired with high-fiber foods and plenty of water when you’re not eating to stop diarrhea. The same goes for meat and junk food, including burgers or sodas, all which can constipate when consumed in significant amounts. – Unripe bananas contain more resistant starch and tannins which inhibit the production of gastrointestinal secretions and suppresses the normal contractions of the muscles of the intestinal tract that move food and waste products along in a process called peristalsis. – Foods that make your mouth dry, like persimmons or unripe quinces (read more about the Properties and Benefits of Quinces), as well as some herbal teas also contain significant amounts of tannins can have a constipating effect and cause stools like rabbit droppings, pellets or pebbles. 5) Sitting all day. Whether it’s winter and you don’t get out much or you have a job that keeps you in your seat all day long every day, sedentarism is not healthy for your bowels. You can counteract small, hard, dry stools by walking one hour every day, whether you go to the park, stroll through the supermarket or do chores around the house. Stretching, doing squats, running, ridding a bike, swimming, dancing are all great solutions. 6) Medical conditions, medicines and nutritional deficiencies. 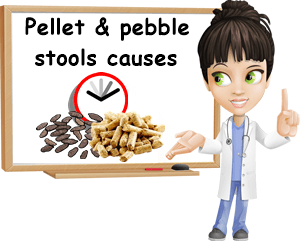 Stools that look like pellets, pebbles or rabbit droppings can be caused by hormonal imbalances such as in thyroid disorders. If you experience frequent constipation like this and it doesn’t go away when you up your fiber and water intake, then it is important you make an appointment with your doctor. Small, hard, dry stools can also occur in irritable bowel syndrome, often alternating with periods of diarrhea. Antacids, some supplements (iron and calcium), antihistamines, antidepressants, antispasmodics, calcium channel blockers, diuretics, diarrhea medication or some anti-inflammatory medication list constipation as a side effect. Severe magnesium deficiency can affect normal muscle contractions, including peristalsis and result in pebble stools. Solution 1: Pebble stools can be relieved by eating only plant foods for 2 days in a row. Your diet should consist mostly of vegetables and a smaller, but sufficient intake of fruits, whole grains, nuts and seeds. After the first stool that doesn’t come out as pebbles, you can resume a normal diet, but make sure it has some fiber and plenty of water. Solution 2: Drink a glass of water in the morning, half an hour before breakfast and coffee and in the hour after. Do so before every main meal throughout the day and you will stay well hydrated. Solution 3: I’m not telling you not to drink coffee. It’s your choice. But to counteract the dehydration it causes, you can drink a glass of water one hour before having coffee and a glass of water in the hour after that. This way, you don’t get dehydrated and will have normal bowel movements. Solution 4: Avoid making refined grains a big part of your daily diet. Choose healthier, whole grain versions instead. And if you do eat refined grains, pair them with high fiber foods such as vegetables, nuts, seeds or fruits, especially leafy greens like spinach or fruits you eat with skin like berries (choose from the Fruits Map). Solution 5: Only eat ripe fruits and avoid unripe, green fruits which have more resistant starches and other fibers (read more about Unripe vs Ripe Fruit). Choose sweet fruits over astringent fruits that make your mouth dry. Also, the best bananas to eat are yellow throughout with tiny, brown spots. Solution 6: Walk one hour every day. Doesn’t matter at what pace or where, just walk to stimulate peristalsis. Solution 7: A little bit of fat facilitates the passing of stools, even of ones as compacted as pebble stools. Solution 8: Check you thyroid and see a gastroenterologist if no dietary change helps relieve pebble stools. Read the list of possible side effects on your medication and work with your doctor to reduce side effects or change treatment, if possible. Up your intake of foods rich in magnesium or take magnesium supplements to support peristalsis and regulate transit. Don’t rely on stool softeners or laxatives as treatment. In the end, you will have to discontinue them and their effects will not persist beyond this. You might as well regulate transit and relieve constipation with diet from the beginning. You will have to do the same anyway at one point.